This post is intended as a basic guide for getting Evernote running under WINE in Linux. If people want to share tips etc, maybe we can build it into something quite useful. Evernote (mostly) works fine for me under WINE and has the last few times I've tried, so I thought I'd share my setup, and if anyone has any further information to add that would be great. *WINE can be a sensitive beast so maybe a list of known working combinations of "WINE version + Evernote version" may help some people? **NOT intended as a "please make a Linux version" thread, there's plenty of those. Not sure if the below WINE settings make a difference, don't have time to test maybe someone can confirm? ***On a side note, I remember that for quite a while Google were packaging a very usable combo of WINE and Picassa for Windows into an installable deb/rpm/etc for Linux because they didn't want to create a native Linux version for whatever reasons. Not a wine/ linux user, but much respect for the detailed guide... thanks! Thanks for the detailed write-up. I'm sure it will be appreciated by many users. I'd like to point you to https://appdb.winehq.org/objectManager.php?sClass=version&iId=30713 - the official Wine App DB entry for Evernote 5.5 . Over there you'll find the reported bugs - a few more than what you listed :-) - and test results for more distributions/ Wine versions. It would be worthwhile IMO if you either moved your guide there or at least posted back a link, so it's visible to more people. As a user of Wine the AppDB is my first stop for finding out how well an application works with Wine. Thanks for the input. I will update my post with links to the wine db and other relevant sites. The wine db is great, but can be quite confusing and often fast out of date. And while I do add relevant info to the wine db as I can, surely there's room on the Evernote forums for some helpful info on running it in Linux? If you have any tips/tricks/known working combinations/etc, let me know and I'll add it to the post. Import looks like this in POL - not sure if regular wine has a Registry Editor? Does it work you import function catalog? In Skitch (version 2.3.1.169) that runs under Wine (version 7.1.31) does not have the capability of describing (annotate) the pdf files. I was following this answer on akubuntu about how to configure wine. I was wondering if anybody could tell me the dll's or the things which I have to download. How can I put of a shortcut of a single note on ubuntu desktop? I use Evernote under Wine. Is it at all possible? In case any of you are interested on a 3rd-party client, take a look at NixNote 2. It's still beta, and it may take some time to synch if your EverNote database is big. But, a few glitches aside, it works quite well for me on Kubuntu 14.04. Version 2 is a Beta, and you'll have to download the source and compile. Quite common for Linux people, unfortunately. There's a stable version 1.5 and a version 1.6, but I don't know how well they are. I'm currently testing solutions for Evernote on Linux. So far every method has serious flaws. I suggest that you file bugs for the crashes/bugs, if they're not already filed ( see https://appdb.winehq.org/objectManager.php?sClass=version&iId=30713) . Wine is a rapid-moving target and you have chances to have the issues fixed in future releases. Can't say much about the other issues you raised. As for Evernote, you seem to have tried every trick I had in my book. This was the point when I decided to give nixnote a try. Truth be told, I tend to create stuff from the web interface, and use nixnote to access if offline, mostly. I followed the instructions above, except I already have version 6 of the Microsoft XML parser installed so left that alone, installed Evernote in Wine. (1.6.2), current versoin of Evernote. It installed but wouldn't open; said I needed to log in and sync my account but didn't give me a chance. I installed it on Playonlinux following the same instructions, and it's syncing now -we'll see. I use(d) EN to manage my ToDo lists. I have templates for repetitive task, so I need an easy copy function which keeps the tags - this exists in the Win client where I can select multiple notes and copy them to a given notebook. The workaround with the duplicate function can work, however it is very frustrating especially with multiple notes (I have to search for each duplicated note and move them to a different notebook one-by-one). The Edit/Copy only copies selected text, not a note with tags. Shortcuts is a feature where you can "bookmark" some notes and they appear in the Shortcuts section (at least on Windows and Android). I usually edit notes in a desktop often while offline (so the web client is not an option), and access them in a smartphone - so I put important todos to Shortcuts for fast and easy access. As I understand deleting can't be done in a 3rd party client for safety reasons. Under this configuration evernote is running fast, smooth and stable. So overall you will have a better version of evernote than the webversion. 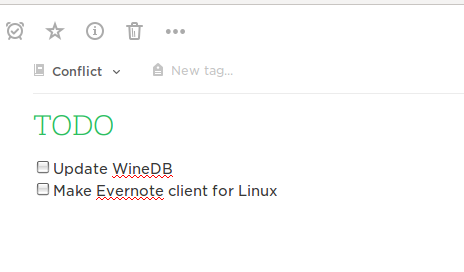 I had never tried Evernote on Wine before. I used clones and the webclient, but always found them lacking. I wanted the full experience and I wanted it on Linux. I'm very happy with the results. It's fast. I mean REALLY fast. If all ok, logout and log back in to Sync your life. I really wanted the latest version (1.9) running, but I couldn't figure it out. Everything kinda worked except the edit windows/preview panes. Editing notes was/is impossible, the WYSIWYG editor didn't show at all, the weird thing is that creating every other kind of note works great but still, no classic editing. If anyone knows the answer, do let us know. This walkthrough also works with Wine1.6, but I had mixed results due to MONO and the fonts. Got very poor results on x64 distro and repos. Will post on WineHQ when I have some days of intensive use. Thanks to rolabear for starting the topic. Note that 5.9.X gives problems with the editors, so don't upgrade. (Edit: ) Install winbind (through `sudo apt-get install winbind`). 3) Disable "Synchronize in the background" in Tools->Options->Tab "Sync"
Thanks for the update guys! 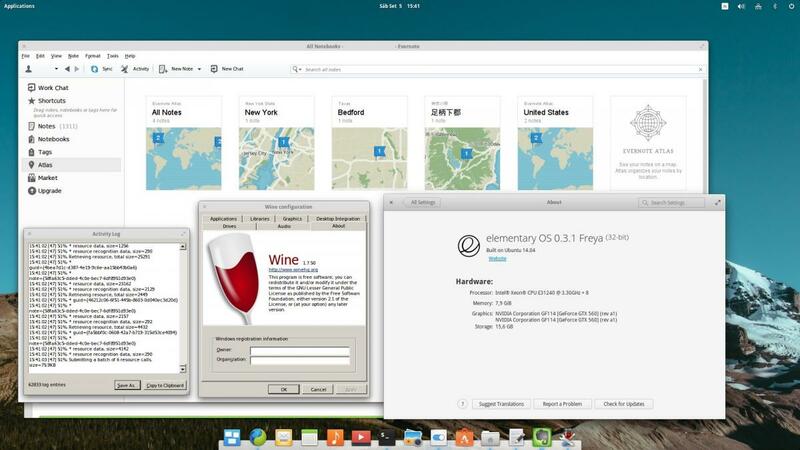 I tried these and EN finally works for me (Kubuntu LTS, Wine 1.7, Evernote 5.8.13 GA). There are some minor hickups (like an occasional mouse lag), but I can live with those. Also EN hugged all cores 100% this morning after waking from a suspend to RAM. Please check my edit: "3) Disable "Synchronize in the background" in Tools->Options->Tab "Sync"
Thanks for the tip. I have done it, however explorer.exe still sitting in my systray (after quitting and restarting EN, and making sure tray icon disappeared). I'm going to test for the CPU hugging, it has occured again today (before disabling auto sync), although not after waking from suspend but during the day. I suspected sync as the troublemaker. A few comments on the above discussion! The last version of EN that worked very well on Wine, for me, was Evernote_5.8.14.8221.exe - later versions didn't refresh the note window when you clicked on a different note. The latest version (5.9.3...) fixes this, but brings another problem - the editor toolbar (which usually pops up when you click in a note to edit it) doesn't appear. In fact it seems that all notes are being displayed effectively "read only". I can't make any edits at all. If anyone has a solution for this, I'd be very grateful! NixNote2 is working very well in the latest release. Although official releases are not so frequent, the Github repository (https://github.com/baumgarr/Nixnote2) is updated often and the author is very responsive to suggestions and bug fixes. So if you're not afraid to do an occasional "git pull" and "make" then that's for sure the way to go. On the issue of shortcuts, if I understand correctly the Evernote API does not expose shortcuts. So NixNote also has shortcuts, but they are not sync'd with the Evernote service. Thank you for the info on NixNote 2. Could you check the aforementioned problems in my #11 comment, please? ALT+letter menubar hotkeys does not work properly. Pressing ALT will jump to the menubar, however I can't use neither the underlined letters, nor the arrows keys. Using a docking station with a larger screen resolution monitor messes up the display in EN under WINE. The area outside the boundaries of the smaller screen do not refresh. These are annoying, especially #1. So I find the Platinum score on WINE HQ an exaggeration. So I find the Platinum score on WINE HQ an exaggeration. Well, the submitter probably found no bugs during testing ... but there are quite a lot of bugs reported by others, myself included, in the Evernote 5.8.x app page. If you find other bugs, please file them and link them to that page, it helps getting a realistic view of what of what works and what does not. @pez - of course a package like EN has a lot of different ways of using it, so different people will report different levels of success. I've never tried or needed alt+ to use the menus (the set of shortcuts already defined is quite extensive). For the issue of the display, I've had this when plugging my laptop into a project. However, if I boot the machine with the projector connected, then EN in Wine uses the whole screen properly. I don't know if this will help in your case! As above, the Evernote API doesn't allow access to shortcuts, so until EN decide to grant this nothing can be done. I've not had any problems deleting notes. By copy you mean duplicate? There is a duplicate note function, yes. I don't use reminders, so have not tested this. I haven't seen this - if you have "sync on shutdown" set, it could be that this takes some time and blocks the restart? Overall these issues don't seem like show-stoppers, and if there are minor feature requests (like sorting of reminders) then these are probably added easily by contacting the author. Mint 17.2 with all the tricks outlined in post 1. Any ideas for troubleshooting please? Use the specific EN version mentioned in the first post. Version 5.9 and 6.x didn't work. To use Evernote 6.x (tested with versions up to 6.4.2) on Linux install PlayOnLinux (it is free), create bottle, based on the 1.8-steam_crossoverhack Wine package, run the Evernote installer, enjoy! Additionally you could want to apply FontsSmoothRGB and Microsoft Core Fonts components to the created bottle. Also URLs don't appear to become links (I can live with that though). I tried this out as well and I have the same issue. I'm running this with PlayOnLinux, Linux Mint 18 with Cinnamon 3.0.7 with same Wine version. I still have the same issue with checkboxes. I suppose that the checkbox glyphs are taken from some library, which is not installed. Hope, Evernote developers could advice, what is that. I have Evernote running on Ubuntu Mate 17.04. Using Play On Linux, 32 bit wine version 2.19. Update: it worked the first 3 times, now when it crashes when I try to start. Clarification: I was playing around with the tray icon and this seems to have messed things up. I've now disabled it and Evernote is working correctly. I'm using the client for Windows via Wine, without major problems, whether it's performace or bugs. The only problem occurs when we leave the mouse over a text input field and this displays a tooltip making the focus leave the field; otherwise the client is fully functional.